Though we love spending the Thanksgiving holiday with our families, my group of friends can all agree on one thing: Friendsgiving is even better! There’s nothing like spending an evening at a friend’s house, indulging in turkey, good conversation, and a few cocktails. If you ask me, spending time and appreciating good friends is just as important as appreciating your family. After all, isn’t it a best friend that you always turn to in moments of craziness? This year, Friendsgiving is being held at my house. That means I’m in charge of all the decorations and ALL the food. I can’t wait! I want it to be the best Friendsgiving ever. 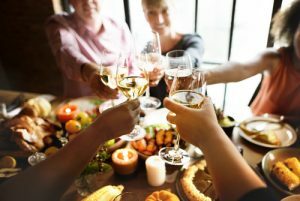 If you too have the incredible honor of hosting Friendsgiving this year, check out a few of these incredible Friendsgiving ideas for the best holiday party all year long. Naturally, the most important part of any event is the invitations! You could text them to arrange the plans, sure, but I always love to receive a good old invitation! 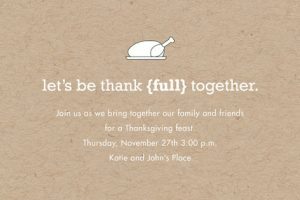 Check out these invitations for Friendsgiving, all available for purchase on Minted. Keep things classy with this chalkboard inspired Friendsgiving invitation. These invitations delivered via email, making them perfect if you’re on a time crunch or just looking to lessen your carbon footprint. They’re surprisingly affordable, too! Find them here. 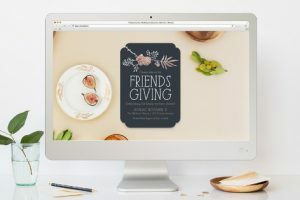 If E-vites aren’t quite your style, you can always send a Friendsgiving invitation the old-fashioned way: via mail! Send the online invite to a local printer and have them print out your invitations for an affordable price. Your pals will be absolutely delighted to receive this in the mail! Purchase this Friendsgiving idea here. 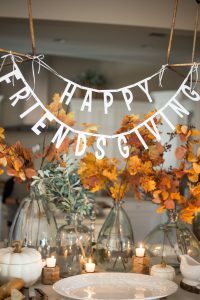 Any party planner knows that ambiance is key, so get your home ready for the holiday festivities with a few easy to create Friendsgiving decor ideas. I’m not lying when I say easy to make…all of these can be created in a flash! I pride myself in having a holiday garland fit for any occasion and that includes Friendsgiving! It doesn’t matter where you hang this festive garland (found at World Market!) your guests are sure to love the Friendsgiving greeting. Plus, wouldn’t this create such a fantastic photo op? Don’t stress about table settings this Friendsgiving! 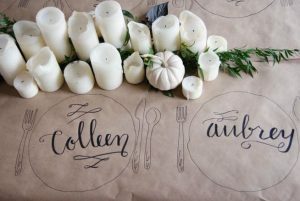 Cover your table in brown craft paper and then use a marker (and a stencil!) to draw out the details of your Friendsgiving table and write the names of your guests directly on the plate. Use candles and a few eucalyptus branches to complete the centerpiece. When the day is over you won’t have much to clean or iron, this tablecloth can be crumpled up and recycled! What a win-win! Your Friendsgiving guests will likely be indulging in all of the traditional Thanksgiving foods come the big day. Instead of slaving over another turkey all day long, feed your guests small snacks and hors-d’oeuvres. I promise, they’ll appreciate the variations in food! 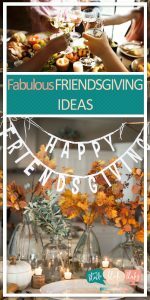 This is one of the easiest Friendsgiving ideas! 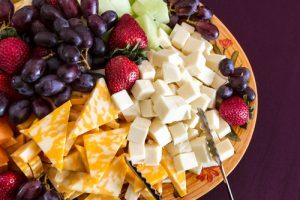 Instead of working hard to bake an elaborate appetizer, put together a small fruit and cheese plate instead! The savory cheeses will get tummies growling and the fruit provides the perfect contrast. If you decide to serve wine, be sure to take note of what wines and cheese pair well together. This small appetizer just turned your event into the classiest affair! I’ll be the first to admit it…I’m not the best at baking pies! It seems like the crust is downright impossible to get right sometimes. My friends told me LONG ago that pies are not my strong suit, so I made it my tradition to make caramel apples as a dessert instead. 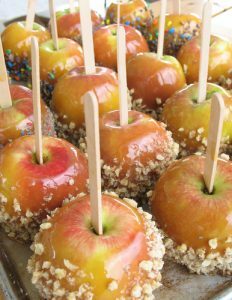 They’re incredibly easy to whip up and all my guests have told me they love them! Don’t forget about the drinks! 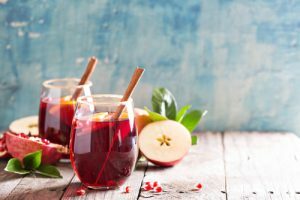 I love to serve a seasonal cocktail for all of my holiday parties, and this beverage has proven to be a guest favorite. To make combine 6 ounces orange liquor (I love Patron’s new liquor! ), 2 cups of orange juice, and 2 tablespoons of honey. Mix well. Once combined, add a cinnamon stick, a chopped Granny Smith apple, a chopped red pear, and two chopped clementines to the mix. Let sit for one hour. After one hour add 2 liters of sparkling sweet wine and a liter of lemon-lime soda (I use Sprite!) to the mix! Serve chilled.